Teaching non-fiction text out of a book can be straight up boring. However, tech savvy teachers can integrate fabulous resources for non-fiction reading comprehension. Teaching non-fiction writing with technology is even better! This year I challenged my class to not only read newspapers and magazines, but also to write one. Very quickly, I came to realize I had overestimated how much time and effort it would take for a classroom magazine to come to fruition. Students chose topics. I instructed that as long as our Principal did not get upset they could write about any topic that interested them (for some reason, many students chose to write about animals). After choosing topics, with guidance students researched and wrote final copies of their non-fiction articles using Strip Designer. Then came time for publishing our class magazine. 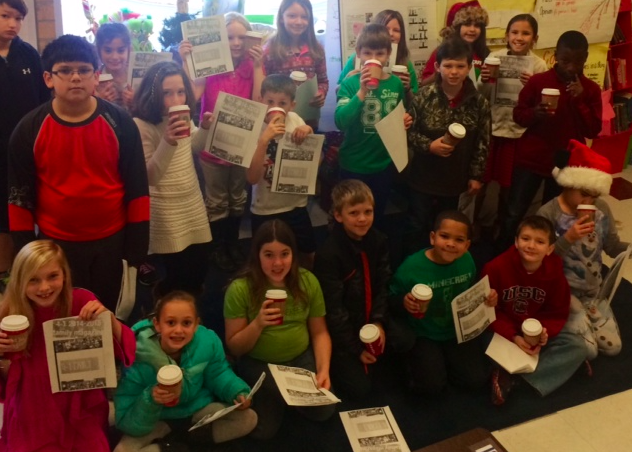 I knew I wanted to make the publication extremely special, but I was not sure how to do so until I got the idea to create a classroom “Starbucks”. Where do I like to read and work most? My neighborhood coffeeshop of course! So, I decided I would bring the coffee shop to our classroom. I stopped by a local Starbucks and they graciously donated 25 cups, lids, and sleeves. I brought these materials into the classroom and made a giant serving of hot chocolate. I then allowed students to choose what type of topping they wanted in their hot chocolate (they could choose one topping between whipped cream, marshmallows, and cinnamon). Finally, I rounded out the kid’s morning by bringing them three different coffee cakes to choose from. Our room was silent for an entire hour. My principal and assistant principal came and read our magazine in the classroom without many students even noticing. Students were invested. Not only did they write their own non-fiction articles on topics they enjoyed, but they also saw their writing through to publication. Non-fiction reading is now connected to non-fiction writing for these students. After students finished reading our class magazine, they shared which article they enjoyed to the most and why. The feedback that was given in the room was powerful. I am now excited to write a second addition to our classroom magazine and see how this positive feedback is applied. It will be interesting to see if topics vary and to observe the overall growth in my students’ writing now that they understand how to write non-fiction text.